Glaceon and Vaporeon. . Wallpaper and background images in the Eevee Evolutions Clan club tagged: evolutions pokemon glaceon vaporeon. Wow, that's AMAZING! 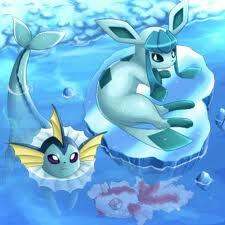 :D I love the goldeen in the water! Nice idea!